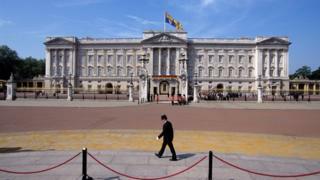 A man has been arrested in the grounds of Buckingham Palace after scaling a perimeter wall, police have said. The 41-year-old was found in the palace grounds by officers seven minutes after an alarm was activated on Wednesday evening, according to the Met Police. The suspect, who was not armed, was arrested on suspicion of trespassing on a protected site and is in custody. It is understood that the Queen was at the palace at the time of the security breach. A palace spokesman said: "We never comment on security, which is a matter for the police." Police officers at the Queen's central London residence were alerted at 20:37 BST, the Met said. Commander Adrian Usher, head of the Met's royalty and specialist protection, said: "I am content that our security measures worked effectively on this occasion and at no time was any individual at risk." But Ken Wharfe, a former protection officer for Princess Diana, Prince William and Prince Harry, said: "It took seven minutes to find this guy, which is a hell of a long time. Ten seconds is a long time, a minute is a long time." He added: "Once somebody is over that wall, unless you catch them immediately there's no telling where that person might go." Mr Wharfe said the problem for security was that the Queen was "quite adamant she doesn't want any additional people patrolling". There have been several security breaches at Buckingham Palace in the past, including the case of Michael Fagan, who got into the Queen's bedroom in 1982 and spent 10 minutes talking to her before she managed to raise the alarm when he asked for a cigarette. In 2003, Daily Mirror journalist Ryan Parry exposed security flaws by getting a job as a footman at the palace using a false reference. In 2013, a man scaled a fence and was arrested inside the palace. He was found at about 22:20 BST in a room which was open to the public in the daytime. Last year two men got on to the palace roof and unveiled a banner in a protest over fathers' rights.